“I congratulate you on a wonderfully unique contribution to Antarctic literature. What an experience! The book is a fascinating combination of expedition diary, historic reference material, (some of my favourite images and quotes), original photography and culinary multiculturalism. A beautifully designed and executed book.” Paula Shackleton, British Columbia. “Expedition cooks and cleaners in the frigid wastes of the Antarctic: a truly different book.” Jude’s Book List, Readers’ Books, California Summer Reading List. “I am an Antarctic marine biologist and contemporary jeweller. For the past few years I have been invited to present a series of 3 lectures on Antarctic Art as part of the Bachelor of Antarctic Studies at the University of Tasmania. I came across the fabulous book (I have just pre-ordered a copy!) 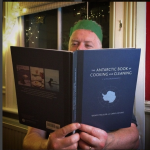 “The Antarctic Book of Cooking and Cleaning”! I would dearly love to use a couple of images in my lecture where I talk about the ‘unheroic era – images of everyday life in Antarctica’.” Dr Karin Beaumont, Oceanides – art of the ocean, Australia. Snow, penguins, ice, more snow…food? Food is not one of the first associations that typically crosses the mind when thinking of the world’s windiest, coldest, driest + most desolate continent, but that is about to change. The Antarctic Book of Cooking and Cleaning is a cultural history and recipe book based around a Russian-Canadian environmental clean-up expedition on King George Island, 120 miles off the Antarctic Peninsula. “My favourite art so far this year: The Antarctic Book of Cooking & Cleaning, out now!” Twitter Victoria Ward, Gooderham, Ontario @hotspurstudio. “Got my copy of the #Antarctica book!! It’s AWESOME! Kudos & Good luck.” Paul D. Miller @djspooky, author of Book of Ice. I love the casual / journal format and am impressed that you made that work so well. Love the recipes as well, and how all the little details of daily life get wrapped up into the larger ideas. It’s also a very beautiful book-object.